This book presents the journey of Turbo-Codes from their first invention and initial design as error correcting codes to their application as video compression tools. This journey is presented in three milestones. 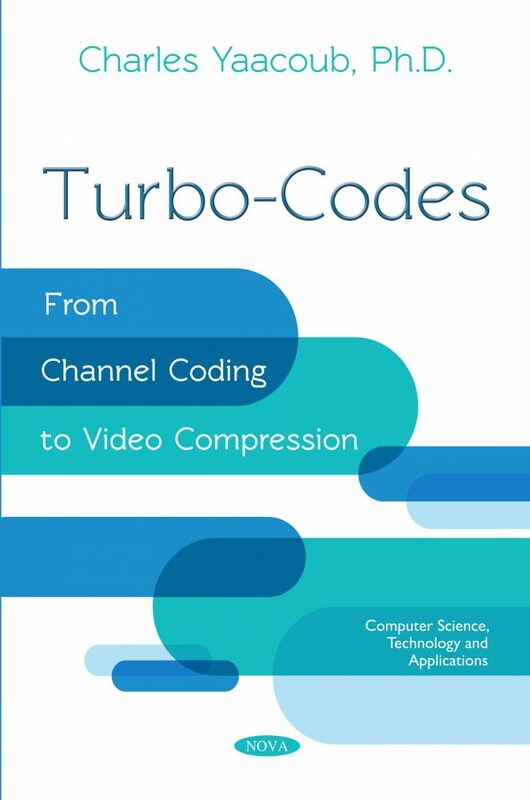 First, Turbo-Codes are introduced as a channel coding tool. Different encoding structures and decoding algorithms are discussed from theoretical and practical aspects, for binary and non-binary Turbo-Codes. Slepian-Wolf and Wyner-Ziv theorems are then discussed, as they constitute the main theory behind distributed source coding (DSC). Turbo-Codes are then presented as a practical tool for distributed source compression. The study of Turbo-Codes application in DSC is also extended to the case of joint source-channel coding (JSCC), where these codes are jointly used for both source compression and error correction. Theoretical models for DSC and JSCC are thoroughly discussed along with the necessary modifications to the initial turbo encoder-decoder system. Different simulation setups are considered and results are presented and analyzed. Finally, Turbo-Code-based distributed video coding (DVC) techniques are discussed. The motivation behind DVC is first presented, followed by a general description of the DVC system model. Different techniques used to generate the side information needed for practical DVC systems are then discussed. Theoretical compression bounds are derived for both error-free and erroneous transmissions. Applications of DVC in the context of single user and multiuser setups are finally presented with different simulation scenarios and performance analysis. Salomon, D. “Data Compression: The Complete Reference”, 4th Ed, Springer 2006. Gallagher, R. “Information Theory and Reliable Communication”, Wiley 1968. Haykin, S. “Communication Systems”, 4th Ed, Wiley 2001, pp. 611-616. Berrou, C; Glavieux, A; Thitimajshima, P. “Near Shannon Limit Error-Correcting Coding and Decoding: Turbo-Codes”, International Conference on Communications, Geneva, May 1993, pp. 1064-70. Hagenauer, J; Offer, E; Papke, L. “Iterative decoding of binary block and convolutional codes”, IEEE Transactions on Information Theory, vol. 45, n°2, Mar. 1996, pp. 429-445. Berrou, C. “The Ten-Year-Old Turbo Codes are Entering into Service”, IEEE communications magazine, Aug. 2003, pp. 110-116. Richardson, TJ; Urbanke, RL. “Efficient Encoding of Low-Density Parity-Check Codes”, IEEE Transactions in Information Theory, vol. 47(2), February 2001. Arikan, E. “Channel Polarization: A Method for Constructing Capacity-Achieving Codes for Symmetric Binary-Input Memoryless Channels”, IEEE Transactions on Information Theory, vol. 55 (7), pp. 3051–73, July 2009. Baudoin, G; Bercher, JF; Berland, C; Courivaud, D; Gresset, N; Lissorgues, G; Jardin, P; Ripoll, C; Venard, O; Brossier, JM; Villegas, M. “Radiocommunications numériques” Tome 1, 2Ed, Dunod 2007, pp. 371-388. 3GPP, “Technical Specification Group: Multiplexing and channel coding (TDD)”, TS25.222 V3.2.0, Mar. 2000. Douillard, C; Jezequel, M; Berrou, C; Brengarth, N; Tousch, J; Pahm, N. “The Turbo Code Standard for DVB-RCS”, 2nd International Symposium on Turbo Codes and Related Topics, Brest, France, Sep. 2000, pp. 535-538. Divsalar, D; Pollara, F. “Multiple turbo Codes”, Military Communication Conference, 1995, pp. 279-285. Sklar, B. “A primer on turbo code concepts”, IEEE communications magazine, Dcc. 97, pp. 94-102. P. Robertson, P; Hoeher, P; Villebrun, E. “Optimal and suboptimal maximum a posteriori algorithms suitable for turbo decoding”, ETT, Vol. 8, Mar.-Apr. 1997, pp. 119-125. Gao, Y; Soleymani, MR. “Triple-binary Circular Recursive Systematic Convolutional Turbo Codes”, 5th International Symposium on Wireless Personal Multimedia Communications, Oct. 2002, pp. 951-955. Haykin, S. “Communication Systems”, 4th Ed, Wiley 2001, pp. 657-660. Aaron, A. Girod, B. “Compression with Side Information Using Turbo Codes”, Data Compression Conference, Snowbird, UT, USA, April 2002, pp. 252- 261. Slepian, D; Wolf, JK. “Noiseless coding of correlated information sources”, IEEE Transactions on Information Theory, vol. IT-19, July 1973, pp. 471–480. Wyner, AD; Ziv, J. “The Rate-Distortion Function for Source Coding with Side Information at the Decoder”, IEEE Transactions on Information Theory, Vol. IT-22, January 1976, pp. 1-10. Puri, R; Ramchandran, K. “PRISM: A New Robust Video Coding Architecture Based on Distributed Compression Principles”, 40th Allerton Conference on Communication, Control and Computing, Allerton IL, October 2002. Aaron, A; Zhang, R; Girod, B. “Wyner-Ziv Coding of Motion Video”, 36th Asilomar Conference on Signals, Systems and Computers, November 2002, pp. 240-244. ITU-T and ISO/IEC JTC1, “Advanced Video Coding for Generic Audiovisual Services,” ITU-T Recommendation H.264 – ISO/IEC 14496-10 AVC, 2003. Ascenso, J; Brites, C; Pereira, F. “Motion Compensated Refinement for Low Complexity Pixel Based Distributed Video Coding”, IEEE International Conference on Advanced Video and Signal-Based Surveillance, Italy, September 2005. Brites, C; Ascenso, J; Pereira, F. “Feedback Channel in Pixel Domain Wyner-Ziv Video Coding: Myths and Realities”, 14th European Signal Processing Conference, Italy, September 2006. Kubasov, D; Lajnef, K; Guillemot, C. “A hybrid encoder/decoder rate control for a Wyner-Ziv video codec with a feedback channel”, IEEE MultiMedia Signal Processing Workshop, Greece, October 2007. Artigas, X; Angeli, E; Torres, L. “Side Information Generation for Multiview Distributed Video Coding Using a Fusion Approach”, 7th Nordic Signal Processing Symposium, NORSIG’06, Reykjavik, Iceland, June 2006. Morbee, M; Prades-Nebot, J; Pizurica, A; Philips, W. “Rate Allocation Algorithm for Pixel-Domain Distributed Video Coding Without Feedback Channel”, 32nd International Conference on Acoustics, Speech and Signal Processing, Honolulu, Hawaii, USA, April 2007. Aaron, A; Rane, S; Setton, E; Girod, B. “Transform-domain Wyner-Ziv codec for video”, Visual Communications and Image Processing, San Jose, CA, January 2004. Aaron, A; Rane, S; Girod, B. “Wyner-Ziv video coding with hash-based motion compensation at the receiver”, IEEE International Conference on Image Processing, Singapore, Oct. 2004. Ascenso, J; Pereira, F. “Adaptive hash-based side information exploitation for efficient Wyner-Ziv video coding”, International Conference on Image Processing, USA, Sept. 2007. Toan Nguyen Dinh; GueeSang Lee; June-Young Chang; Han-Jin Cho. “A Novel Motion Compensated Frame Interpolation Method for Improving Side Information in Distributed Video Coding”, International Symposium on Information Technology Convergence, Korea, Nov. 2007. Misra, K; Karande, S; Radha, H. “Multi-hypothesis distributed video coding using LDPC codes”, 43rd Annual Allerton Conference on Communication, Control, And Computing, Monticello, USA, September 2005. Chung, SY. “On the Construction of Some Capacity-Approaching Coding Schemes”, Ph.D. thesis, Massachusetts Institute of Technology, 2000. Goldberg, DE. “Genetic Algorithms: Search, Optimization, and Machine Learning”, Addison-Wesley, Reading, MA, 1989. Yaacoub, C; Mhanna, G; Rihana, S. “A Genetic-Based Feature Selection Approach in the Identification of Left/Right Hand Motor Imagery for Brain Computer Interface”, Brain Sciences Journal, Vol. 1, Issue 7, Special Issue on Brain-Computer Interfaces: Current Trends and Novel Applications, Jan. 2017. Chang, PH; Leou, JJ; Hsieh, HC. “A genetic algorithm approach to image sequence interpolation”, EURASIP Journal on Signal Processing: Image Communication, Vol. 16, No. 6, pp. 507-520, 2001. Hung-Kei Chow, K; Liou, ML. “Genetic motion search algorithm for video compression”, IEEE Trans. Circuits and Systems for Video Technology, Vol. 3, pp. 440-445, Dec. 1993. Chun-Hung Lin; Ja-Ling Wu. “Genetic block matching algorithm for video coding”, IEEE International Conference on Multimedia Computing and Systems, Japan, Jun. 1996. Yaacoub, C; Farah, J; Pesquet-Popescu, B. “A Genetic Frame Fusion Algorithm for Side Information Enhancement in Wyner-Ziv Video Coding”, 17th European Signal Processing Conference, EUSIPCO’09, Glasgow, Scotland, August 2009. Yaacoub, C; Farah, J; Pesquet-Popescu, B. “A Genetic Algorithm for Side Information Enhancement in Distributed Video Coding”, IEEE International Conference on Image Processing, ICIP’09, Cairo, Egypt, November 2009. Maugey, T; Yaacoub, C; Farah, J; Cagnazzo, M; Pesquet-Popescu, B. “Side information enhancement using an adaptive hash-based genetic algorithm in a Wyner-Ziv context”, IEEE International Workshop on Multimedia Signal Processing, MMSP’10, Saint-Malo, France, October 2010. Yaacoub, C; Farah, J; Pesquet-Popescu, B. “Feedback Channel Suppression in Distributed Video Coding with Adaptive Rate Allocation and Quantization for Multiuser Applications”, EURASIP Journal on Wireless Communications and Networking (WCN), 2008, Vol. 2008. Yaacoub, C; Farah, J; Pesquet-Popescu, B. “New Adaptive Algorithms for GOP Size Control with Return Channel Suppression in Wyner-Ziv Video Coding”. International Journal of Digital Multimedia Broadcasting (IJDMB), special issue on Advances in Video Coding for Broadcast Applications. 2009, Vol. 2009. Aaron, A; Setton, E; Girod, B. “Towards practical Wyner-Ziv coding of video”, IEEE International Conference on Image Processing, Barcelona, Spain, Sept. 2003. Ascenso, J; Brites, C; Pereira, F. “Content Adaptive Wyner-Ziv Video Coding Driven by Motion Activity”, IEEE International Conference on Image Processing, Atlanta, USA, October 2006. Ortega, A; Ramchandran, K. “Rate-distortion methods for image and video compression”, IEEE Signal Processing Magazine, August 2008, pp. 23-50. This book is mainly addressed to senior engineering and graduate students, faculty, engineers, and researchers, in the fields of electrical and computer engineering, computer science, multimedia transmission, telecommunications, and applied mathematics.